March 20th, 2018, Charlottetown – Short track speed skaters Peter McQuaid of Charlottetown and Jenna Larter of Brookfield will be representing P.E.I. at the Canadian Junior Selections #2 competition in Calgary, AB this week. 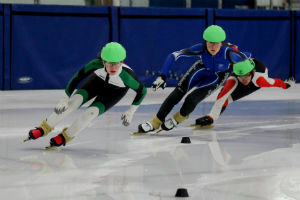 McQuaid will be among 60 of the country’s top junior men, while Larter will compete in a field of 51 of Canada’s top female skaters between the ages of 14 and 19. McQuaid is making his third appearance at the event, while Larter is making her first trip. Jenna Larter (left) will be one of two Islanders competing at the Canadian Junior Selections #2 in Calgary this week. Photo courtesy of Kristen Binns. McQuaid will look for a strong close to his successful season which saw him compete in a full slate of Quebec provincial circuit meets, as well as on the Atlantic circuit where he claimed second place overall in the Atlantic Canadian Short Track Championships in February. Larter is looking to keep building on her strongest season to date. Now in her fourth season, she broke a pair of seven year-old provincial records for Junior women earlier this year and qualified to compete on the Quebec circuit, where she made a successful debut in January. Larter enters the competition as 38th seed among females, while McQuaid goes in seeded 48th among the junior men. Racing gets underway Wednesday morning, with the 1,500 metre and 500 metre distances, which continue through the first three days. The 1,000m event will go on Saturday. Competitors at the Calgary event will earn ranking points toward the 2017-18 Canadian Junior ranking list, which will help to qualify them for additional national level events next season. For more information on the event, visit www.speedskating.ca.